For something so integral to attaining the complete look, toothpaste choice is surprisingly over looked. Most men just settle for the nearest tube they can get their hands on – as long as it’s mint, job done! Not the modern gent however; he sources out the toothpaste of tradition, the paste with decades of proven success rather than a two week ‘unbiased’ clinical trial. If that sounds like you, the chances are you’ve come across classic Italian toothpaste maker Marvis. The flavours in a Marvis toothpaste are created by offsetting the aroma of mint, to provide the freshness that you need, with innovative notes to offer you a long-lasting pleasurable taste sensation. The traditional Fluoride-free, helps prevent tooth decay, fights tartar and plaque while keeping your breath fresh with a hint of fragrance. 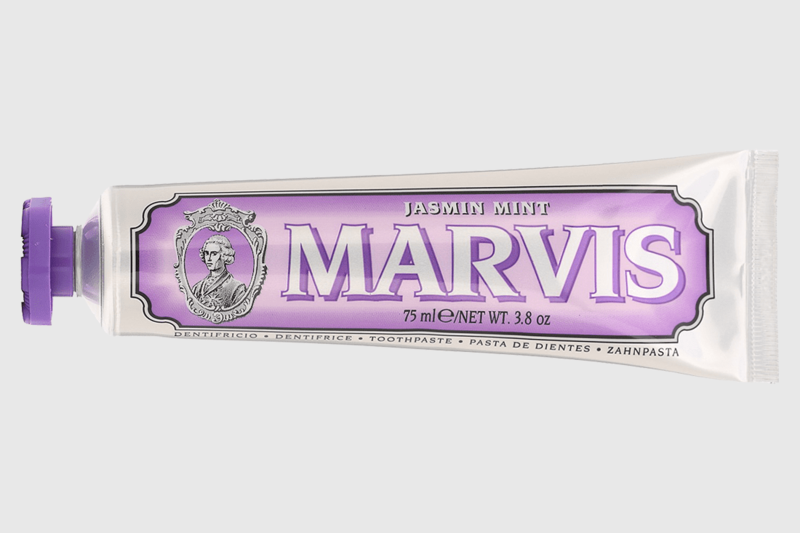 The paste of choice is the Jasmine; the Jasmine Mint toothpaste combines the sweet, floral notes of Jasmine with a minty base. Furthermore this toothpaste looks the part in its luxuriously colourful tube and elegantly sculpted cap.